Kallu means Toddy in Malayalam,and Kallapam is a kind of rice pancake ,traditionally prepared using ‘Kallu’ and tastes almost similar to lacy edged Palappam.As toddy is not readily available nowadays,its closest substitute yeast is used instead.This can be taken with any type of stew or spicy veg/non-veg curries. Here goes my Amma’s recipe for Kallappam.. Combine sugar and yeast in 1/4 cup of luke warm water and keep it aside for 5-10 mts.It’ll rise to almost double in size.Now grind together all the above ingredients except salt and yeast adding very little water to a smooth paste.Mix in yeast mixture,stir well and allow it to ferment for 8-10 hrs.Here I always keep it in an electric oven,after heating it for 15-20 seconds. Just before preparing add a pinch of salt and stir well.The batter should be similar to the consistency of iddli batter. Heat the tawa/pan and apply 1/2 tsp of oil,just like you do for preparing dosa.Pour a ladlefull of batter into the tawa.It’ll spread by itself,no need to use the ladle bottom to spread it. Close the pan with a lid and allow it to cook inside. After 1 or 2 minutes,turn the appams and cook the other side too until it is lightly browned. Always cover it with the lid.Serve hot . This entry was posted on November 7, 2006 at 6:59 am	and is filed under Bread & Rotis, Breakfast Dishes, Traditional Kerala Dishes. You can follow any responses to this entry through the RSS 2.0 feed. You can leave a response, or trackback from your own site. wow! would love to try out this one:)looks yummy, but why adding just a pinch of salt? Thanks for a wonderful recipe.I have the same question.Will a pinch of salt be enough? Does this taste a little sweet? Can I substitute onion for shallots? This is kinda sweet,Lakshmi ammal..You can always substitute onion ..
a great recipe! the method is so simple and the end product very tasty! ooh. I love this. Thanks a lot! another treasure from u.BTW, I did see what u meant by the page acting weird in 800X600 setting..U have to increase the central section’s width, but I don’t know how to manipulate it in wwordpress. Will let u know if I come across something. Yeah,what u said is right..I need to increase the central section’s width,but i donbno how to do that..Pls let me know if u come across something..
delicious..had this dish once long time ago..would love to try it home..thanks for this authentic recipe.. I think the texture of Kallappam will be spongy!!! Nice Pic. Thanks for sharing. Thanks Krithika..Try it and let me know about it..
OMG! Looks like heaven. I have come to LOVE Kerala food and ordered a cook book too! You guys eat weel and how! :D Beautiful dishes, both of them..
Will be trying this one out very soon. thanks for this recipe. This recipe is very new for me. To me its just like an uttapam which is sweet. Thanks a lot for some new. This recipe is very new for me. To me its just like an uttapam which is sweet. Thanks a lot for something new. I had some doubts about the recipe. You can use the ponni rice,Zerin.No need to increase the amount also..I don’t think it’ll create any problem..I noramlly use rosematta rice/kerala rice for the cooked part..What happened with ur appam..Did it ferment well? Can u pls explain what was the problem in it..
just wanted to know if u can use the brown rice to make this appam. 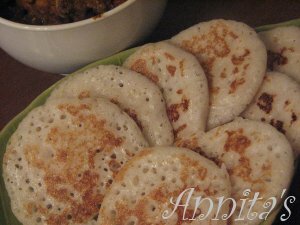 Annita, we’d kallappam (using yeast of coure, since I dont get ‘kallu ‘ in Kuwait!) for breakfast today. It was good. My hubby and kiddo enjoyed with chicken curry. I usually make this appam without shallots and cumin seeds. I think I have read this recipe in Vanita before. Never tried then. Happy to hear that u all liked it,Beena..And thanks for letting me know about it. thanx for the reply. wen i made the appam with the recipe my sister told me, the problem was that it did not ferment well, inspite of using all the ingredients as it was in the recipe. the only change that i made was using the ponni rice for the cooked part. but my sis says her recipe is really good and has worked for her all the time. now i haven’t tried your recipe yet.letme try it then will let you know how it turned out. Your sisters recipe might also work Zerin..Just find out why your batter didn’t ferment..I don’t think its the ponni rice,it can be the yeasy or you might have added more water. Hi, i had a question , can we use coconut milk instead of grated coconut like palappam ? thnx. Really happy to know that Priya..Try the cakes too..i bet you could it..Failure is the stepping stone to success…isn’t it? So go ahead buddy…and let me know how it turned out . 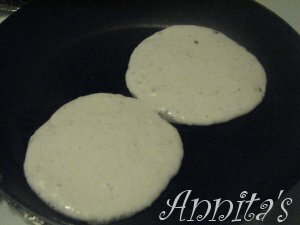 Annita, i made ur appams twice in the last week! everybody in my house is a big fan of it now. Thanks so much. I always make the other appam and so these kallappams were such a delicious change!Love ur recipes! thnx a lot for the kallapam recipe…since long i wanted to make this…we used to get this item in school boarding…but didnt knw how to make… i’m gng to try out this today itself…i’m sure my kids will luv this…hmm..let me go n’soak the rice..
Pls let me know how it turned out for u,Sonia.. Wonderful recipe. This is little similar to aapam recipe which I prepare. YOu have a wonderful blog and lovely recipes. I will keep visiting your’s. To make 75-100 kallappams, what proportion of ingredients should I use? I like your blog and have tried few recipes which turned out well. Thanks. You can prepare around 25-30 kallappams with the quantity i’ve given in the post..So you might have to increase the ingredients by thrice for 75-100 . 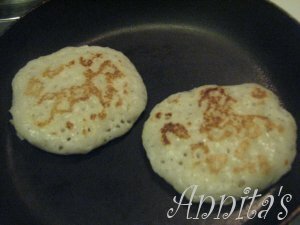 I just came across your website and looked at this recipe for Kallapams. Now being a North Indian, you can well imagine I am not very good at cooking your lovely recipes. One big question is you mention the use of cooked rice in the recipe. Does that mean the rice that has actually been cooked before or something else? Would you be so kind to let me know? Since the recipe looks scrumptious, I can’t wait to try it so would love to hear from you as soon as possible. No,i mean the rice that is cooked only..you can cook sona masoori rice and use it as the recipe suggests.. I think i’m a little late in replying you..I’m sorry ,was busy for last 2 weeks..
being away from homeland,it was my long cherished dream to prepare appam some day.the picture of kallappam itself was very tempting.the very next day i tried it and it came out so well that it had the same taste as the one prepared in my home.it was a wonderful experience. the recipe was so explict that i didn’t have any any doubt about it.thank u so much for posting such an excellent recipe. Thank you very much Juny,for taking your time and letting me know about it. Kallappams were delicious. 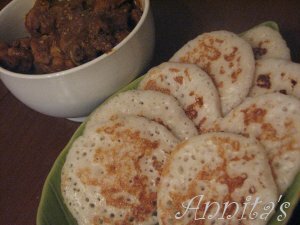 Could you give the authentic recipe for the stew (veg) which goes with Appams? Yes you can do that ,Bhaskaran..
Anita, please tell how to make vatayappam and palappam. Your kallapam is very tasty, thank you for good contributions. I’ll be posting a Vattayappam recipe real soon..
anitta,i am a frequent visitor of ur blog…which yeast have u used for making kallappam..active dry of rapid rise??? ?i usually use the fleischmann’rapid rise yeast.but at times it doesnt rise properly..also is there any problem if the water we use to mix the yeast is hot instead of warm??? Please don’t take it as an offense. Yeast is not a Bacteria, but it is a Fungus, a living organism. To the lady asked about hot water, Yeast can multiply very well at the optimum temperature in the range of 30°-37°C (86° -99° F) and it will die above 50° C. So, don’t use hot water. hi annita.. iam a regular visitor of ur blogandi tried ur kallappam 2day and it was really really good..we usually make paalappams but this was very good..thanks a lot an keep posting wonderful recipes as u do always..take care..
Is there any substitute for YEAST Plzz let me know. thanks for the recipe- I followed it – except for soaking the rice for quite long – but struggled to get the appam off my pan – any suggestions for preventing this in the future . appam was so tasty and soooo beautiful.thanx a lot..
just wud like to know if yeast is derived frm toddy??? this appam came out so well. i loved it infact i prefer this better than the lace appam. However when i made the kallappam i substituted the grated coconut with ellapan thenga(the coconut which is slightly about the tender coconut stage but not the complete coconut)and added some more sugar i had seen my amma do this long back and thats how i tried it and it came out great. I think you may also like this. Annita, finally I tried this recipe. This was in my must-try list for very long time now. It turned out great. Very easy to make, soft and yummy. We all loved it. Thanks a lot for this wonderful recipe. 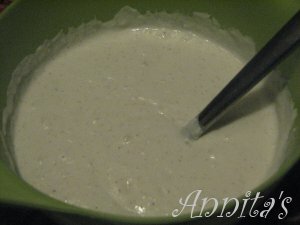 Annita, when possible, could you post Achappam recipe too? Rg,I dont have the mould for achappam….Let me see if I can borrow the mould from someone,ok..
My late aunt used to make kalla appam with toddy, and the batter is steamed, just wondering, is the recipe the same? Thanks anita, i was looking for this recipe..want to try it for the buffet soon. Hi annita, very nice recipe. I too make with same proportions, but dont add jeera, cumin and onion. …and i dont proof yeast as well. i grind it all together…Loved ur version…Love the way u present things and how you make it looks so simple. But we call it paalappam instead of kallappam….ur paalappam we call it as vellayappam!! !for me this appams are always confusing. pls tell me….2 cups meaning 2 cups of mota chawal or 1 cup mota n 1 cup long grain? Thank you so much for your wonderful treasures! I always head over here when I’m looking for authentic mallu recipes like this Kallappam I have been meaning to try! Ria of Ria’s collection and I are hosting an event celebrating Kerala cusine called Kerala Kitchen. We would be honoured to have you over for it! Hi Anita, this Kallappam looks yummy! thanks for the recipe. questions for you if it’s allright. Could it be just me or does it look like some of these responses come across as if they are coming from brain dead visitors? :-P And, if you are posting at other sites, I would like to keep up with everything fresh you have to post. Could you list of the complete urls of all your social sites like your linkedin profile, Facebook page or twitter feed? I wanted to hold a party for my Indian buddies some of whom are vegetarians. I will be having this appam with vegetable stew and chicjen stew as one of the items, can you suggest some more items, please. Will vegetable Pullav with paneer tikka masala (for veg) and chicken hyderabadi go we’ll with it? Suggestions for the menu are welcome. but typically people don’t speak about these subjects. To the next! Cheers!! to make 250 nos of kallapam howmuch will be ingradients qty will be?